Matt Clarke has backed Christian Burgess to win his Pompey starting berth back. But the 21-year-old is determined it won’t be him dropping down to the bench. Burgess has been an unused substitute in the Blues’ past two matches, with Jack Whatmough partnering Clarke in central defence in the victories over Oldham and Oxford. It’s the first time the former Peterborough talent has been taken out of the action in League One by Kenny Jackett during his reign as boss. Clarke revealed Burgess has reacted well after losing his starting place following a number of indifferent peformances. And he believes Burgess’ axing highlights to every member of the squad that they’ll face the same fate if they’re not performing to the standard required. Clarke said: ‘It has been a theme this year. The team has chopped and changed a little bit and it does happen. ‘Obviously, Burge has got to take it on the chin. It’s not like he is going to be dropped forever. ‘He’ll be back in the starting line-up before you know it, but it’s something he’s probably not really used to. ‘Burge has got to react well to it. We all know what a good professional he is. ‘He’s still being supportive in the changing room, saying “come on boys, we can do this”. ‘He’s not sulking and I wouldn’t expect him to. I wouldn’t expect him to be a negative around the team and he’s gone about it the right way. ‘When you have a good squad, you have got to be on your toes. ‘You have to be aware, if you’re not performing you may get dropped. ‘It’s something as a footballer you have got to relish. ‘No-one signs for a club saying you’ll be playing every week and there will be no humps in the road. The new partnership of Clarke and Whatmough has proven profitable in the past two fixtures. Jackett’s troops have delivered wins over Oldham and Oxford and kept two clean sheets to boot. 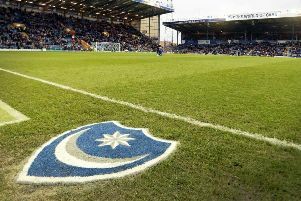 The 2-0 success at the Latics was the first shut-out Pompey registered in 16 games. And although Clarke hasn’t played with Whatmough too frequently, he feels the pair have gelled well together. ‘Obviously, I haven’t played much with Jack,’ he added. ‘However, I’ve trained with Whaty loads of times and I know what he’s capable of. We all know what a good player he is. ‘It is something that is slightly different – I think I might have called him Burge a couple of times at Oldham! ‘But it’s something you just adapt to. Whoever you play with and what the centre-back combination is we’ll do whatever we can to do the best for the team. ‘Jack is a quality player and you can see that by the reaction he gets from the fans and how highly he is thought of.